First unveiled as a concept car at the Frankfurt Motor Show in September 2009, Fluence Z.E. will be launched in the UK in mid-2012. It is aimed at private customers and fleet operators looking for a four-door saloon which is both economical and more respectful of the environment. Fluence Z.E. is the first affordable, all-electric three-box saloon, and completes Renault's offer in this segment with a version that doesn’t produce any emissions during its use on the road. It features elegant lines, a comfortable interior and a raft of useful technologies. Along with Kangoo Z.E., this model is the first of the Renault Z.E. range to reach the European market from late 2011. Fluence Z.E. will be manufactured at the OYAK-Renault plant in Bursa, Turkey, on the same production line as that which makes the internal combustion-engined versions of Fluence. With an overall length of 4.75 metres, the electric version of Fluence is 13cm longer than the internal combustion-engined model. This has enabled the batteries to be located behind the rear seats. The sides have consequently been redesigned to maintain the visual balance of the original version. Employing fluid, crisp lines, the design of Fluence Z.E. features longer quarter panels which harmonise with the longer rear overhang. The rear window, now framed by lengthened quarter panels similar to those seen on some coupes, is extended by a gloss black strip. The lights also contribute to the overall visual balance of the car by extending onto the sides of the body. Fluence Z.E.’s interior comes with all the features you would expect to find in an internal combustion-engined version. The on-board computer now displays essential 'electric vehicle' information, such as instantaneous and average fuel consumption, range, battery charge and discharge. The 'energy gauge' indicates the battery's level of charge, in the same way as a conventional fuel gauge. The trim strip on the uncluttered dashboard is in an exclusive aluminium shade. Thanks to the lengthened rear section, boot capacity remains unchanged at 317dm3, in spite of the incorporation of the battery. A folding panel is incorporated at the back of boot to facilitate storage of the battery charging cable, optimised when this panel is positioned vertically. Access is simplified thanks to the low sill (698mm) and wide aperture (1,020mm). Fluence Z.E. provides more than 23 litres of storage space in the cabin, including a nine-litre illuminated glove box, a 2.2 litre cubby in the centre console and front door bins of 2.6 litres each. Peak power of this synchronous electric motor with rotor coil is 70kW (equivalent to 95hp) at 3,000rpm, while maximum torque is 226Nm. This torque is delivered instantaneously and ensures crisp, immediate and constant acceleration across the power range. Having maximum torque available every time you press the throttle guarantees a safe and enjoyable drive. It's a unique, astonishing feeling, and perfectly suited to today’s mobility needs and driving challenges. You no longer need to shift gear, either; you just concentrate on the road ahead. Driving is as fun as it is reassuring. 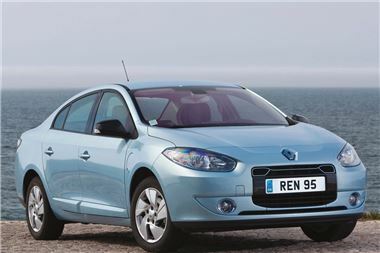 Renault UK has appointed a network of 20 Renault Z.E. Expert Dealers who have invested in specialist tooling, training for both sales and workshop staff (including accreditation to a European standard for electrical safety from both the IMI and Lloyds Register) and showroom display. In addition these Z.E. Dealers will have a demonstrator for each model in the Z.E. range. Renault electric vehicles come with a sale or lease price comparable to that of their diesel-engined equivalents (after the Plug-In Car Grant, ‘PiCG’ financial incentive). Depending on market and tariffs, the cost of the energy used by a Z.E. vehicle is between five and 10 times lower than that of the fuel burned in an internal combustion-engined vehicle. For example, with Fluence Z.E, a range of 115 miles costs approximately £3 (depending on price per kWh) which marks a clean break compared to the fuel budget required for an internal combustion-engined vehicle. With an electric vehicle, the battery hire cost must also be included in the calculation. For an annual mileage of 9,000, for example, the additional cost is just under 11p/mile (based on a monthly hire agreement of £81 over 3 years). Further mileage and duration permutations will be available nearer the launch date. Renault electric vehicles are affordable both to buy and run, and stand out as an attractive option for business customers and ordinary motorists alike. It couldn’t be easier to enter Renault's electric world thanks to the Z.E. Box, a practical all-in-one pack, which you collect upon delivery of your Fluence Z.E. It answers every question you can ask about electric mobility. The Z.E. Box includes all the useful information and contracts related to the vehicle, battery, battery charging and related services. Renault has thought of everything to guarantee peace of mind. The price of Fluence Z.E. includes Carminat TomTom Z.E. LIVE navigation as standard equipment. This system has been specially designed to the meet the needs of Renault Z.E. motoring. Owners also benefit from My Z.E. Connect, a package of simple and practical services to remotely monitor your vehicle's range using a computer or smart phone via the ‘Z.E. Services’ application. When you purchase your Fluence Z.E., you don't actually buy the battery in the car. This remains the property of Renault via RCI Financial Services. Customers take out a hire agreement which guarantees a battery at an affordable price, fully operational and a level of performance. An almost inexhaustible range of mileage and contract length options will be available to business customers and private motorists. These contracts can be extended indefinitely. Meanwhile, should the vehicle be sold on, a new contract is signed with the new owner. The quickest and safest solution is the Wall-Box, a wall-mounted charging point installed in a garage, car port or parking place. It is installed by the local energy provider. A standard charging cable is delivered with your Fluence Z.E. for battery charging at the home via a Wall-Box or at a public battery charging point. For occasional charging, Renault proposes an optional lead which can be connected to a domestic 220V power supply. Renault has endeavoured to simplify every step. As part of the battery hire, and regardless of the pricing plan you have chosen, you receive a comprehensive 24/7 breakdown cover. It also covers flat batteries, whereby you will be towed to the charging point of your choice, within a distance of 50 miles. A temporary replacement mobility solution is also offered to enable you to reach your destination (replacement vehicle, taxi, accommodation, etc. ).